Weather stations, sensors and hardware electronics for professional, research, agricultural and hobby use. EARNING HIGH SCORES IN SENSOR COMPARISON STUDIES. Based on direct comparative testing. Based on testing, soil and dirt buildup on the helical MeteoShield will not have an effect measurement accuracy. MeteoShield also reduces maintenance of your temperature & humidity sensor probes. The Helical Radiation Shield requires no regular maintenance. Even though dirt buildup will provide no noticeable reduction in performance, dirt or dust accumulation on the plates and bracket can be cleaned with soap and water. Do not use solvents. MeteoShield solar radiation shield technical specifications and dimensional drawing. Radiation shield mounting kit for Meteoshield. Illustrations of different mounting configurations using u-bolts, screws or Bandimex stainless steel band mounting system. Illustration of how to disassemble and assemble MeteoShield solar screen. Disassembly voids product warranty. 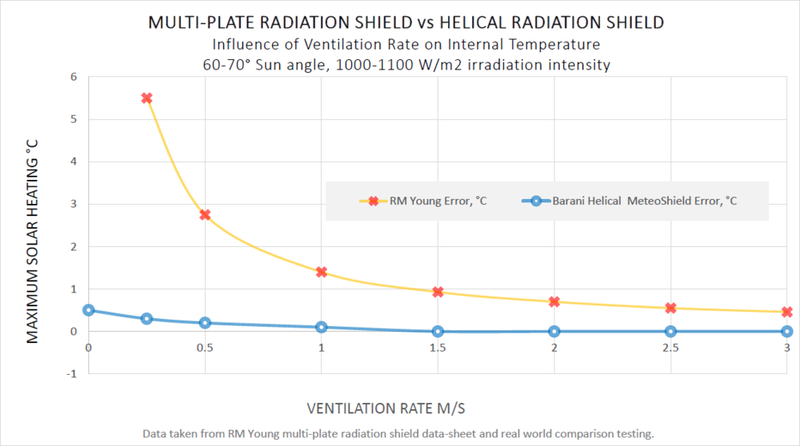 Comparison of a professional multi-plate radiation shield with the helical MeteoShield in highly dusty and dirty environment in roadside weather station applications. Photo documentation clearly shows the benefits of MeteoShield in protecting temperature and humidity sensors from a dirty environment.